Google’s US homepage for all mobile browsers now looks more like the Google Search mobile app. Google has started rolling out its new Discover feed to US users visiting google.com on a mobile device. Google announced the new feed as part of its 20th anniversary revamp of search on mobile, which replaces today’s clean blank page with a search box with many more suggestions, in line with the Google app for iOS and Android. Google wants the site to surface relevant information for users by predicting what they’re interested in rather than waiting for users to type in a search term. As 9to5Google reports, Google’s mobile search site now has a feed of cards with suggested content under a topic category with the Discover star icon. Clicking the topic displays more related articles and allows users to follow the topic. Next to each topic is the control icon where users can control whether they want more or less of that type of content. Discover is available on all mobile browsers so the experience will be the same across Safari and Chrome. The new mobile homepage with Discover hasn’t reached European users yet. Google will roll out Discover in English and Spanish starting with the US and expanding to other languages and countries soon. 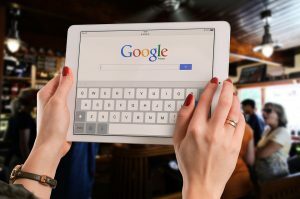 The feature reflects Google’s belief that search should be possible without a query, and search can be carried out with images and video rather than just text. To that end, the company last week launched Google Lens in Google Images on mobile. Lens is currently available in Google Photos. In Google Images, pressing the Lens button displays dots on products and objects in images, allowing users to search for items they might want to buy or research related objects. Lens in Images is currently only available for users in the US, but will be coming to other countries where Google Images is available. Google says new topic headers explain why you’re seeing a particular card in Discover.